I was going to write an April Fool’s joke that I was pregnant, but I figured that would be tempting fate and I really don’t want to do that. I need fate on my side. At least until I’m 50. It’s a new month so, obviously, I’m starting a new eating program. I’ve thought a lot about this and I realize I need to use my strengths. Of course, when it comes to eating, I have no strength. I stress eat and I have a lot of stress. So I eat a lot. Which would be great if I ate a lot of lettuce. But when you’re stressed, does lettuce really do it for you? If you’re being honest? You may be asking yourself: How is this going to help me stick to healthier eating? If I channel any superior feelings I may have about, say, house colors into superior feelings about eating choices, then perhaps I won’t eat as much cake because I’m better than people who eat less cake. Crap. Writing this out makes it sound incredibly stupid. But I’m still going to try and work with it. Because it’s a new month. And I need a new eating program. And I’m running out of ideas. I wonder if a piece of cake will help me think better. 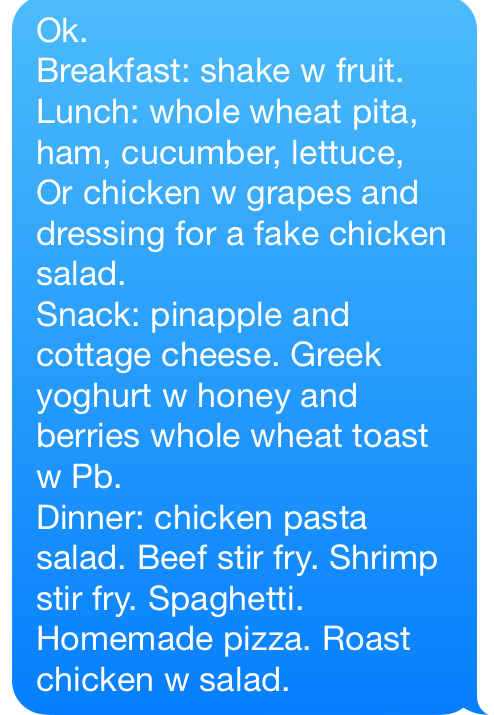 I’ve even meal planned for the whole entire week. Seriously, where are the gold stars? This entry was posted in Uncategorized and tagged April's Fool, eating, eating better, eating program, training. Bookmark the permalink. I LOVE this post…I think you can do it because your house colors are WAY better than the two toned mustard yellow.